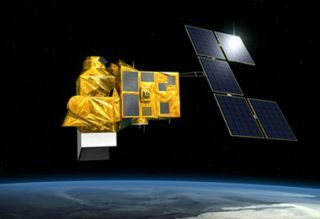 An artist's interpretation of France's new Helios 2B military reconnaissance satellite in Earth orbit. An Ariane 5 rocket is beingreadied to haul a French reconnaissance satellite to orbit Wednesday in a raremorning launch from the Guiana Space Center in South America. The Helios 2B satellitewill join an orbiting fleet of military platforms with optical and infraredimagers to map battlefields, monitor terrorist threats and enforce disarmamentand non-proliferation treaties. "Images collected by thesatellites provide necessary intelligence data to the French senior authoritiesand also to the forces deployed on the ground," the French defenseministry's Helios press kit said. Officials said Frenchmilitary action in Kosovo, Lebanon, Afghanistan, Chad and Darfur demonstratedthe Helios system's value. The 9,259-pound Helios 2Bspacecraft will join two other Helios satellites already in space. Helios 1Awas launched in 1995 and Helios 2A arrived in orbit in 2004. Six European countries,including France, will be users of Helios 2B data. The satellite is due forliftoff at 1626 GMT (11:26 a.m. EST) Wednesday from the ELA-3 launch pad at theEuropean spaceport in Kourou, French Guiana. The 151-foot-tall rocket mustblast off in an instantaneous launch window, or else wait until another day. The Ariane 5 launcherrolled from its final assembly building to the launch zone Tuesday morning.Workers made electrical, fluid and communications connections between therocket and ground systems later on Tuesday. The rocket will be flyingin the Ariane 5 GS configuration with Vulcain 1 engine, upgraded solid rocketboosters and an upper stage fueled by storable hydrazine and nitrogen tetroxidepropellants. The launch team will beginassembling early Wednesday morning, beginning the launch countdown at 0456 GMT(11:56 p.m. EST). Engineers will check electrical systems at 0856 GMT (3:56a.m. EST) and begin fueling the first stage with liquid hydrogen and liquidoxygen at 1136 GMT (6:36 a.m. EST). The first stage's Vulcainmain engine will be chilled down at 1306 GMT (8:06 a.m. EST). The launch teamwill verify good communications with the rocket through telemetry, tracking andcommand systems at 1516 GMT (10:16 a.m. EST). Seven minutes beforelaunch, computers will take control of the countdown in a synchronized sequenceof events to pressurize propellant tanks, switch to on-board power and take therocket's guidance system to flight mode. The Vulcain engine willignite as the countdown clock reaches zero, followed by a health check andignition of the Ariane 5's solid rocket boosters seven seconds later to sendthe nearly 1.7 million-pound launcher skyward. Rolling onto a northerlytrajectory from the launch site, the Ariane 5 will burst through the speed ofsound in less than a minute and empty its solid-fueled boosters 2 minutes, 20seconds after liftoff. The conical payload shroudwill jettison three minutes into the flight after the rocket passes through theatmosphere. The Vulcain engine will fire until 9 minutes, 36 seconds afterlaunch, when it will shut down and the first stage will separate nearly 250miles over the Atlantic Ocean. The storable propellantupper stage's Aestus engine will next light for a lengthy burn lasting morethan 16 minutes. At the time of second stageshutdown, Helios 2B and its upper stage should be in a sun-synchronous orbit atan altitude of about 423 miles over the Arctic Ocean. The rocket and payload willcoast halfway around the world before Helios 2B is deployed in communicationsrange of a ground station in Perth, Australia. Spacecraft separation istargeted for 59 minutes, 23 seconds after liftoff. Wednesday's mission will bethe seventhflight of an Ariane 5 rocket this year on commercial, scientific andmilitary launches. It will also be the 193rd launch of an Ariane rocket sincethe family's debut in 1979. The Ariane 5 launcher will have conducted 49 ofthose missions after Wednesday's flight.